Last week I wrote about Steve Gerber’s Defenders, a 1970s comic that was as singular as it was strange. That book stuck with me as a kid, and partially inspired by Steve’s crazy work, I would go on to have a comic book writing career of my own. 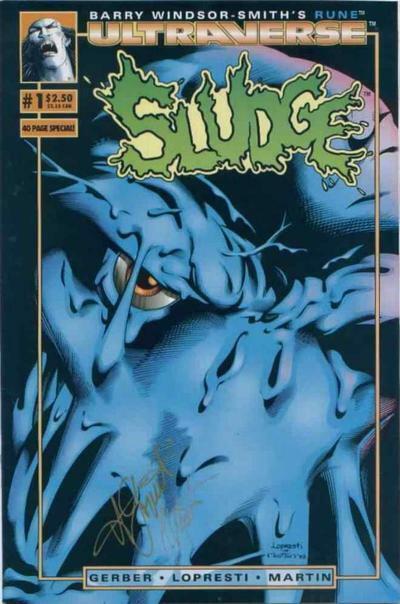 My time in comics was unsatisfactory in a lot of ways, but one of the highlights was working (however briefly) with Steve on his original creation, Sludge. Having helped launch Image Comics, the Malibu Comics brain trust had first-hand evidence that an original superhero universe could carve out a chunk of a Marvel and DC-dominated market. In 1993 they decided to go for it in a big, splashy way with the Ultraverse, an all new, full-color superhero line co-created by some of the bigger name writers in the business, like Steve Englehart, Mike Barr … and Steve Gerber. For my own part, I was pretty burned out as a comic book writer by the time the Ultraverse came around, and I wouldn’t have had the name value to participate in the launch even if I had been up to the task. But it was obvious that the Ultraverse was going to be the only game in town and I worked hard around the edges trying to land a book. Once the line matured and deadlines started to slip, I managed to secure a couple fill-in assignments for Ultraverse inventory stories. One assignment was a two-parter for Rune, which I’ve already examined here on Longbox Graveyard. 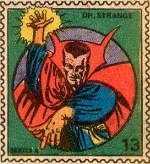 Another was a fill-in story for Steve Gerber’s Sludge. There are folks who still remember the Ultraverse, but there isn’t a lot on the web about Sludge. Sludge was a corrupt New York cop named Frank Hoag who was killed after finally standing up to the mob, then rose again as the sewer-monster, Sludge. He lurked in the shadows, was virtually indestructible, melted flesh with his touch, and revealed his inner struggle through story captions demonstrating his torturous thought process. 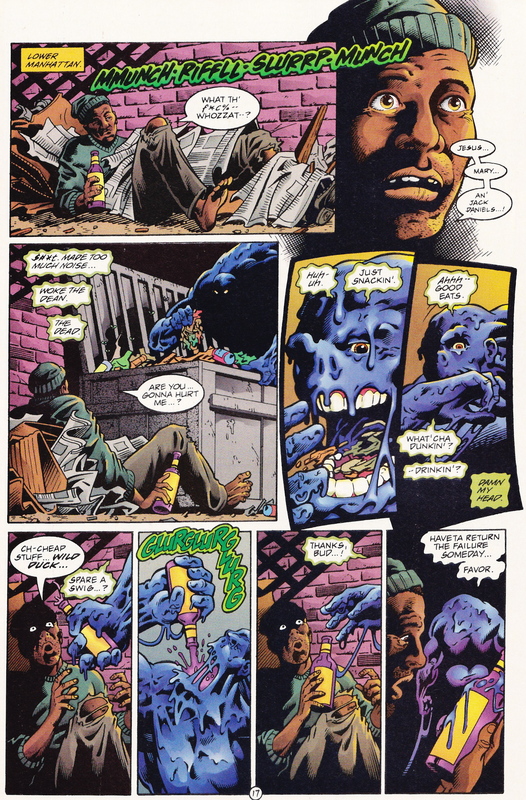 Challenged by Malibu Editor-in-Chief Chris Ulm to create an original monster comic series, Steve Gerber said that the concept for Sludge came to him during an epiphany at the Arizona conference where the Ultraverse was born. 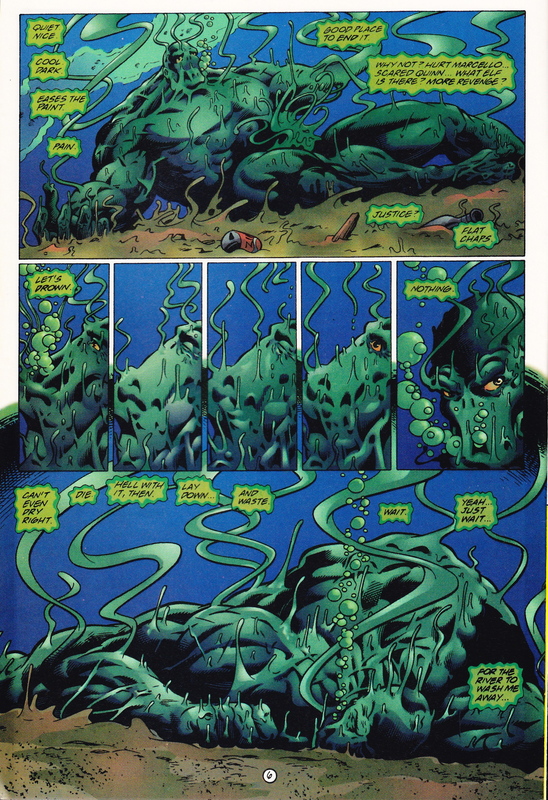 Despite his past association with Man-Thing, Sludge wasn’t Gerber trying to out-do himself with another swamp monster, or an attempt to fill a certain niche in the Ultraverse line. From the outside looking in, it’s easy to jump to those conclusions, but for Gerber, at least, Sludge was its own thing. Marketing challenges aside, anyone thinking Gerber would under-serve his own creation as “just another swamp monster” was barking up a very wrong tree. One of the things I learned from Steve was how the first responsibility of a creator is to respect his own work. If you go into a job thinking it is a lesser assignment or a knock-off or a joke or whatever, then you can’t possibly do a good job. More to the point — why are you wasting your creative time doing that kind of work? Steve was completely locked in on Sludge, as he was with all of his work. He walled out the world, didn’t care if people thought the character was another Man-Thing, didn’t care if the book was selling well, didn’t care if the Ultraverse was going to stick or not. Actually, saying Steve “didn’t care” gives entirely the wrong impression. In my experience, Steve did care — passionately, deeply, maybe too much — about every aspect of his work. What I mean to say is that Steve did his best to keep those external and possibly negative influences from impacting the work. It was pride, and professionalism, sure, but it was more than that. I think it was a kind of idealism, all the more impressive for a writer who had been chewed up by a nasty fight with Marvel over ownership of Howard the Duck. Another creator might have expected Malibu to “pay for his divorce,” but Gerber seemed to put that earlier heartbreak behind him, and put the energy into his work. Or maybe Steve just had a mature understanding that getting even ultimately doesn’t lead anywhere. I first worked with Steve as the editor and writer of Ultra Monthly. The idea behind Ultra Monthly was that it was a news magazine from inside the Ultraverse — it told the story of the Ultraverse through news stories and “photographs,” relating only what an outsider would be able to divine about the super-powered derring-do of the Ultraverse. I guess it was kind of like Marvels, except that Ultra Monthly was a news magazine, and not a comic (and we didn’t have a couple guys named Busiek and Ross on board, either). Anyway, the point was to show a “street” level view of the Ultraverse, but it was also to promote the characters in the line, and that proved especially challenging for characters that lurked in the shadows of this new fictional world. I don’t think I ever got a Sludge story into Ultra Monthly. Each creator had to sign off on anything I did with their characters, and Steve was adamant that Sludge was a legendary figure, like Bigfoot, and he just shouldn’t appear in the magazine. My pleas that Bigfoot was a frequent cover boy for the National Enquirer (and that, after all, I was just trying to promote Steve’s book) fell on deaf ears — Sludge appearing in the news, even fictional news, didn’t fit Steve’s concept of the character and he wouldn’t budge. The only people who saw Sludge were the guys he killed and the down-and-out bums who shared an alley with the monster. Sludge was Gerber’s baby, and Steve was true to his character even if it ultimately might hurt his sales. I don’t know as Steve remembered me from Ultra Monthly, but when Malibu decided it was time to commission inventory stories to fill gaps when Ultraverse deadlines were missed, Steve didn’t object to my taking a crack at Sludge. But neither did he make it easy. As was the case with my Rune story, I first had to submit a concept, and later a full plot — more preliminary work than I would have done on a book of my own. To avoid conflicting with the book’s continuing continuity, I decided to do a flashback story about Frank Hoag’s earliest days on the police force. I wanted to find out what had turned rookie Frank Hoag into the corrupt cop we saw get gunned down by his mafia masters in Sludge #1. Too many liberties are taken with the character of Sludge rather than dealing with the difficulties the character presents. *Sludge is not driven by vengeance. Ever. He considers it a waste of time. He could be driven by rage or anger (a thin but important line) or even by his selective urge to see justice done. 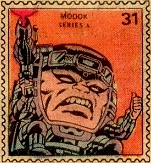 *Sludge’s recollections seem perfectly clear throughout the story. They wouldn’t be. His confusion doesn’t automatically go away when he thinks about the past. Another way should be found to do the flashbacks … Maybe they should come from Emily, and not Sludge — may not work either, just a thought. A lot of time is spent describing the characters’ emotions in almost Wagnerian terms. While that is okay where Emily is concerned, Sludge doesn’t engage in much pathos or talk at length about his feelings (or anything else). Fire the guy walking around in the Sludge suit and put the REAL Sludge at the center of the story. Think about it, mull it over, think about it some more. Doing the math, I notice Steve was about my age now when he offered me that direction. I wonder if I would be as helpful to writers trying to work under my direction today? Being as I was a hack writer who just wanted to get paid and get onto the next book, Steve’s notes drove me crazy. But I could respect the way Steve was protecting his creations. It was a message that stuck with me and I credit it as an early drop of water that started to erode the rocks I had piled atop myself in what was to date a miserable career as a writer and creator. I took Steve’s notes to heart, re-wrote my plot, received approval, and wrote the full script. It was my work, under Steve’s strict direction … so my story isn’t exactly a lost Steve Gerber Sludge script (for that you need to go here), but it is kinda sorta the next best thing. My Sludge script was never published, though I’m sure I was paid for it. I don’t think it even had an artist assigned. Reading it again, after all these years, it seems to me a nice piece of writing, but not so great a comic book script. Too much of the action is internal, and too much relies on a fill-in artist being able to wring convincing and sometimes subtle emotions out of the characters. While it would have been nice to get another story into print, this tale really is better experienced in the mind — its unlikely the story would have been improved by pencils. I’ve put the script up for your review HERE — give it a read and see what you think. I lost touch with Steve after submitting my script. We were never close — our relationship was limited to these few Ultraverse jobs — but I always liked Steve, and admired the man and his work. I didn’t realize it at the time, but Steve gave me a gift in that he helped me understand how hard it is to do quality work (a lesson Lorne Lanning would finish drilling into me during my years at Oddworld Inhabitants). Steve also demonstrated how to be professional and dignified as a creator, even if “all” you are writing about is a talking duck or a mucky sewer monster. I was saddened when Steve passed, both because I enjoyed his work as a fan, and because of our brief professional association. The comics world — and the world as a whole — was a better place when Steve Gerber was in it. Posted on February 8, 2012, in My Stuff and tagged Gerber, Malibu Comics, Man-Thing, Marvel Comics, Monsters, Sludge, Steve Gerber, Ultraverse. Bookmark the permalink. 13 Comments. That was one of the interesting things about the Ultraverse. Dave Olbrich put together the original contract, and Chris Ulm – as Editor-In-Chief – was the editorial enforcer, so to speak. One of the things – and this came up at the original Founders conference in Scottsdale – that all of the Founders had experienced from other publishers in the past was editorial disregard for their creations and their work. If, for example, another writer came aboard and wanted the make changes to the character, the continuity, or the direction, or reboot it, or kill off a character, and the publisher/editor approved, then the original writer had no say. We heard a lot of “war stories” around that conference table. Ulm took that to heart with the idea – I don’t believe this was contracted, I think this came from Ulm – that the Founders would have input and approval over how their characters were written by others in guest-appearances or in fill-in issues and crossovers, even making dialogue notes. And you can see how deeply Steve thought about his work and his characters. As the Ultraverse shifted, books were cancelled, Marvel bought out Malibu, new writers and new directions were set, and Chris (and I) left to do other things, that original ideal didn’t last, but the heart was in the right place. Next time it should be in the contract. In light of the recent Gary Friedrich/Ghost Rider story, it’s pretty clear that EVERYTHING should be in the contract. I love that the foundations of Malibu were so strongly rooted in creator’s rights. My own contracts were generous in that regard (and I believe they were the standard Olbrich contract, that you mention above). Those terms gave all of us the chance of hitting the big casino (as would happen for Men in Black). You guys basically gave the Image guys the keys to the kingdom, from a rights standpoint, plus there was Bravura/Creatorverse, the whole Ultraverse launch … “Creator Rights” may just be fading letters on Malibu’s Ozymandias plaque out in the desert but you at least tried to do the right thing. Was Malibu’s pro-creator stance influenced to any meaningful degree by Dave’s relationship with Jack Kirby, and the screw job he suffered (and is suffering) over his work? Ahh. Contracts! Here’s more than you ever wanted to know. A whole bunch of stuff came into play at once with Malibu’s creator-owned stance during the company’s black-and-white years. Dave and I had both worked at Fantagraphics which was staunchly in the creator rights camp, and we’d seen how Jaime and Gilbert Hernandez and others were able to control their own destinies. And we spent time with Gil Kane, listening to his industry war stories and his attempts to create original IP like Blackmark and Savage. 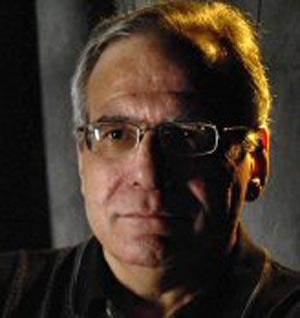 We were both friends with Jan Strnad, who was big on creator rights and hung on to the rights of his original creations. Jan was publishing the work of others through his Mad Dog Graphics imprint and creators that worked for him retained their rights. I created a couple of different cartoon humor magazines (including one for Mad Dog) and I only bought one-time rights from the contributors. Plus, I had been a working cartoonist in the 80s and had been retaining rights to my work whenever possible (and collecting reprint fees for reuse because of it). 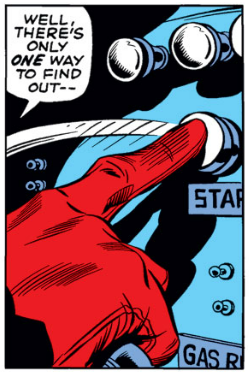 And you’re right that Dave was friends with Jack and Roz – and a frequent guest at their house – and was there when Kirby’s art was being held hostage by Marvel. We also had practical considerations at Malibu as well – we knew we weren’t going to be paying a lot upfront for the comics we were publishing and we knew we had to offer some kind of decent incentive program to attract creators to a new company. So we came up with a system that would pay advances quicker, a simplified royalty structure that didn’t charge any overhead against the books, and a contract that had the creators in charge of their rights. If anyone were to contact us for rights info, we’d forward them to the creator(s) and be done with it. Gerard Jones and Will Jacobs had already gotten some interest in The Trouble With Girls from HBO before we’d published it, and later on Mike Valerio got Stealth Force optioned for a feature film, and when that optioned expired he later sold the property outright to Aaron Spelling Productions, and Roland Mann got Cat & Mouse optioned for a TV series. Another very practical consideration was that at the time neither Dave nor I (and later Chris Ulm and Scott Rosenberg), had any Hollywood juice. We didn’t have any of the necessary contacts in show business to actually go around and pitch material. We really wanted to publish comics and not spend our time rushing from meeting to meeting. We’d talked to a handful of people and the business really was different then – it was all about sales figures, not concept, and it was hard to convince a producer that the concept of a 3000 copy seller was valid for exploitation. Until Men In Black, of course. The original Malibu contract was assembled by Dave, cobbling together bits and pieces from other contracts we’d collected over the years (we had a couple of different Eclipse contracts and a creator-owned one from Dark Horse, among others), and tweaking them and adding in our own thinking, all of which was then vetted by a lawyer with entertainment experience. Many of those same terms got cut and pasted into subsequent Malibu agreements. And it was a constantly-evolving and fluid document that was always getting updated and corrected as time went on. Now aren’t you happy you asked? This is brilliant, Tom, thanks for the extended reply; in the fullness of time I’d like to use it as a seed for a whole creator rights post between you and the Ulm and I (if you don’t mine it yourself for Comix 411 in the meantime). I’ve Tweeted the link to this comment directly to my little stream but I doubt it will get much traction … which is a shame, because we seem to be in some kind of publisher/creator death vortex right now (most recently with news the Walking Dead creators are at each others’ throats) and it’s worth remembering that creators and publishers can sometimes play nice together. Did Malibu’s position on creator rights cost the company anything off the bottom line during acquisition talks with (first) DC, and then ultimately Marvel? I know Marvel bought Malibu with an eye on your coloring system (and with an eye toward denying it to DC) — would the acquisition price have been substantially higher if the company’s IP rights weren’t encumbered by those pesky creators?